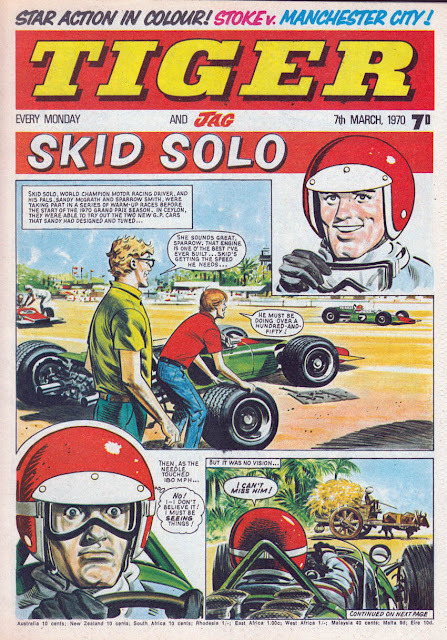 Skid Solo art by John Vernon. 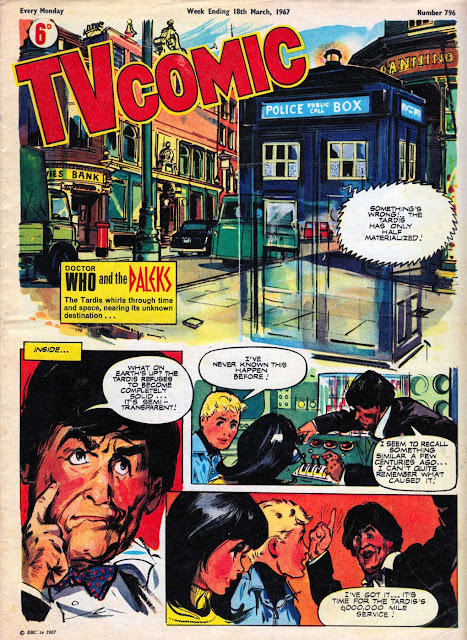 Decades ago, it was common practice for the covers of British comics to feature a story, or at least the start of a story. The initial reason was that as the early comics of the late 19th Century / early 20th Century only had 8 pages the editors wanted to make sure their publications were giving value for money. Another reason that publishers of old liked to start stories on the cover is that they believed they held the attention of potential readers for longer than one single image would. And the longer it held their interest, the more likely they'd be to buy it. As time went on, and the page count increased, it became less necessary to feature strips on the covers, and comics (particularly adventure comics) tended to prefer using one large image for impact. These days it'd perhaps be considered too juvenile for 2000AD or Striker to start a strip on the cover. Here's a selection of British adventure comics from the past that regularly put strips on their covers. 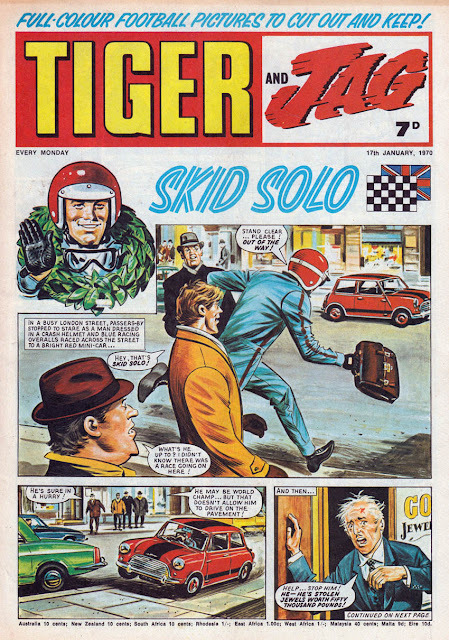 I've scanned several Tiger covers as that comic used cover strips more often than its stablemates. 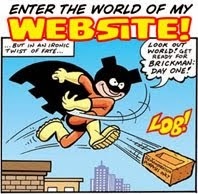 What's your preference for adventure comics? One big representational image, or a story starting on the front cover? 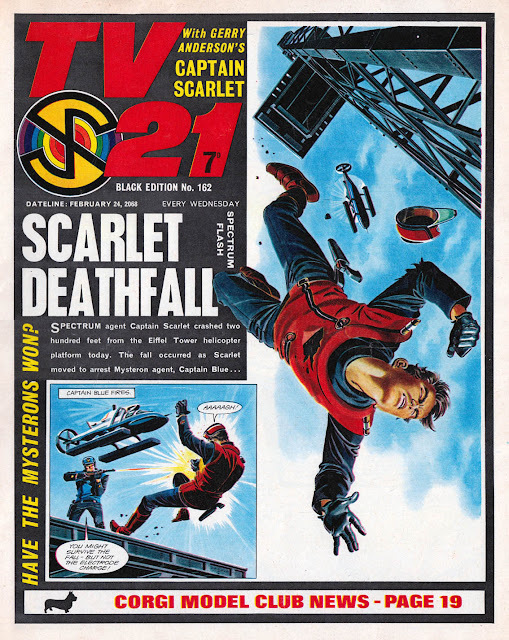 TV21 cover by Mike Noble. Johnny Cougar cover by Sandy James. 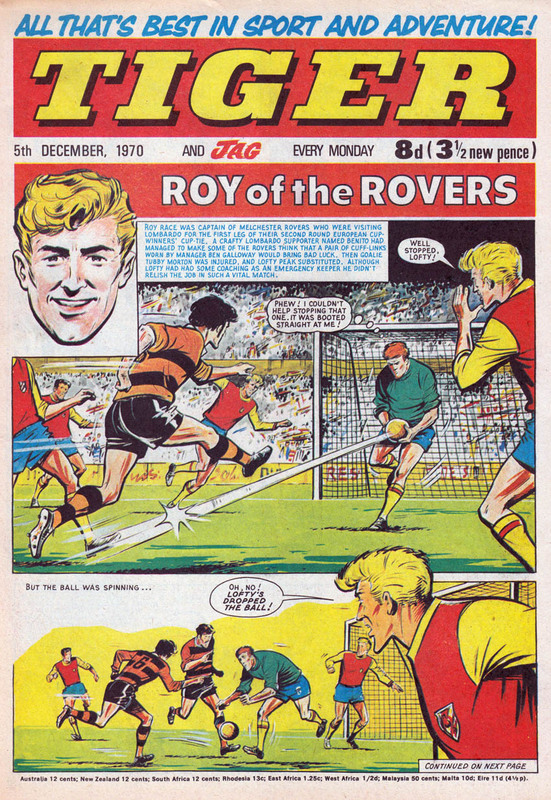 Roy of the Rovers art by Yvonne Hutton. 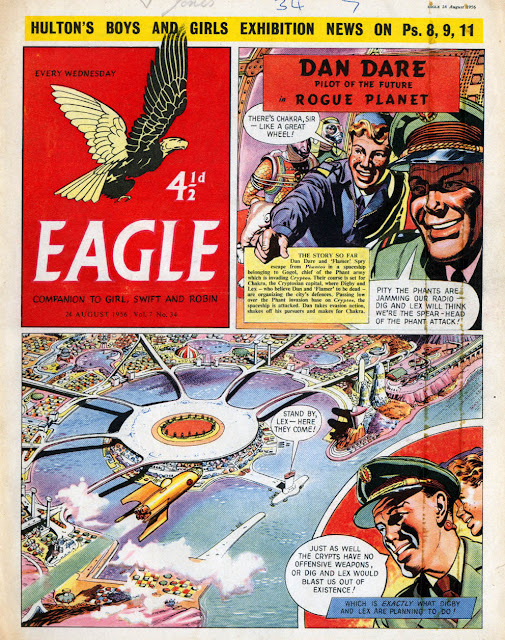 The new EAGLE also liked to start DAN DARE on the cover for several years. 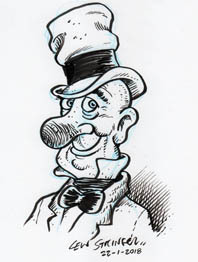 It always struck me as being a crafty way of helping a strip hit a weekly deadline. 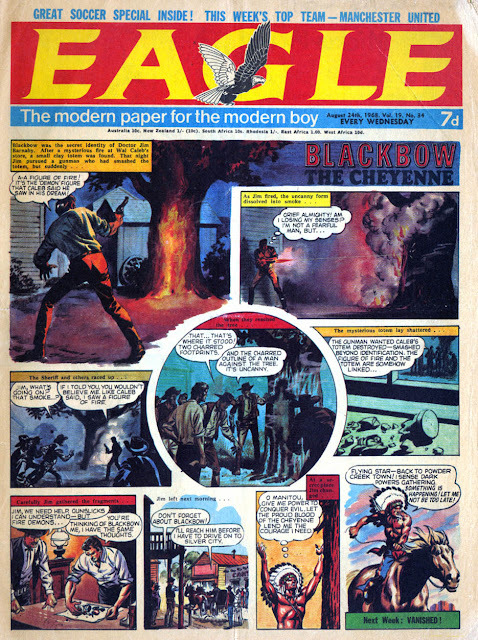 A cover generally required less panels (thanks to a large bold images, masthead and sundry cover lines) than an additional interior page for the same strip. Therefore a cover + 2 pages was more achievable than 3 colour interior pages. 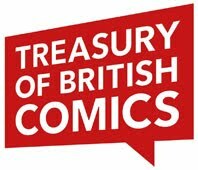 Marvel UK revived the idea very late in the company's history. MARVEL ACTION HOUR (which only ran for four issues) used the cover as the first page of either the IRON MAN or FANTASTIC FOUR strips. Oddly, neither strip was a reprint of Marvel's direct adaptations of the TV show. I think the fortnightly closed when the company was merged into Panini (at that point another part of Marvel's over-extended empire). Marvel Action Hour was a flop unfortunately. 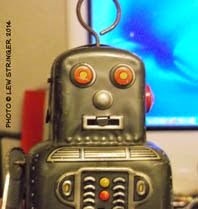 There's a blog post about it I wrote a few years ago. It was nice to see them try starting stories on the cover though. So what did you think of Jodie Whittaker? Best thing to happen to Dr. Who since Tom Baker in my opinion. A change is as good as a rest. I thought she was even better than I'd anticipated, Colin, and convinced me she had the "Doctorishness" (for want of a better word) right from the start. Funny script too, which she delivered perfectly. I've never had a problem with the idea of a female Doctor. (Women are great, and the nay-sayers should get to know a few.) The character can change size, shape, hair colour, etc, so changing a few more chromosomes to become a woman isn't unusual for a Time Lord. She has the same characteristics as before; bravery, selflessness, principles, a bit daft, so she IS The Doctor. 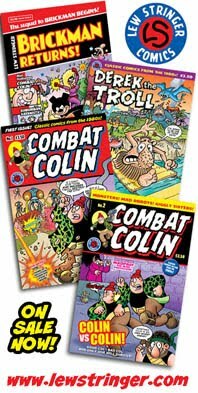 But... this is a thread about comic covers, so going back on topic, what do you prefer, Colin? 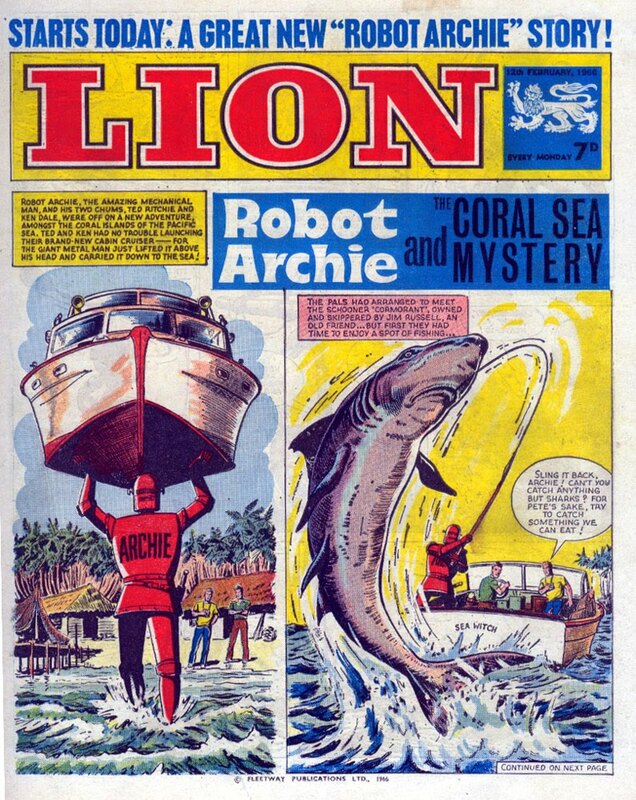 One big impact image or a comic strip on the covers of adventure comics? I'm all for the cover story. Running a story on the covers meant getting to see a favorite feature in full color. 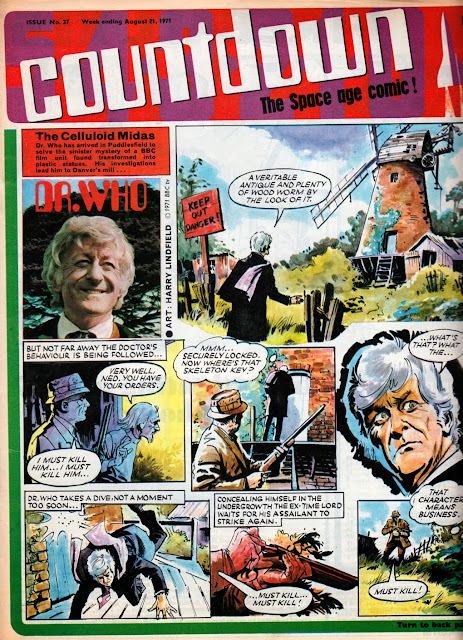 And the color work was often smashing, as demonstrated by the examples here of Blackbow, Captain Scarlet, and Dr Who. I'm all for the big cover image personally. Story covers never really drew me in, though that TV21 / Captain Scarlet one is pretty amazing - I guess because the main image of him falling is so dynamic, it kind of feels like a single cover image to me. A lot of those story covers back then weren't actually that eye catching, at least not to me. Mind you, I was never that excited by Valiant's 'Who Is it?' covers either. They were beautifully drawn of course, but the idea never grabbed me. I'd much rather've had Kelly's Eye or Adam Eterno in a cool cover shot. I bought Valiant despite the cover, and I'd probably say the same for most story cover comics. I tend to agree with you on Valiant, Pete. I never thought putting an article on the cover was a good idea, but I guess it gave the comic its own identity, and that Mike Western artwork was amazing. I felt that the 1960s covers, such as "Is it True?" and "Could It Happen?" were more dynamic than the 1970s celebrity "Who Is It?" covers. By the time Valiant changed to feature dynamic illustrations based on the contents (in 1975/76) it was too late unfortunately. Sales had slipped and didn't recover, - but at least the comic had a good long run of 14 years. 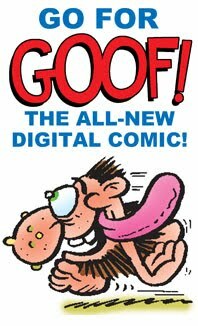 Definitely, and a good list of truly great strips in that time, of course. I definitely prefer a dramatic single image on the cover! I really prefer strip covers as it gives you both a good look at the stories and art inside, tells you what you can expect from the cover and gives extra space for a bigger story really, even if it's only a small amount. Next to that, Mort Wisenger era shows great ways of covers by having a scene based on the comic often shocking or surprising the reader, which is something that was heavily done with Horror comics. For example, I can't remember the Issue but a Cover of the Flash has his on TV taking off his mask showing his face. The two adults watching seam none-bother, by the young wally west is shocked that he is showing all of the world he is the flash! that makes readers think "HUH? why on earth would he do that?" if you notice the adults you also think "Why aren't they bothered?". So you buy the issue to read the story. Great job. But then it came to a time which we are sadly still in, which seamed to appear in young childrens comics first, where you just stick a generic poster cover which has nothing to do with the story, and often features characters that aren't even IN the comic ¬_¬. 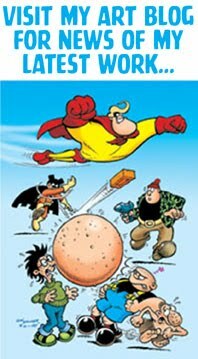 Luckly, ones like Beano haven't quite gotten that bad they do have covers that have something to do with the inside story. Look at the covers of something like the rare 90s kids comic 'Helter Skelter'. Good content, good art, but the covers are just.. pretty bland group shots of characters, as most of the time it was said that think the character the kids like on the front and they'll buy anything (Look at all the drugs and stuff that has come out over the years with just that.. Superman Safety scissors, Popeye toy train, Pepper pig vitamin supplements.. they don't even ever come with a little comic strip like Space raiders used to ¬_¬ (I've said before, that kinda british comic strip is heavily undervalued). 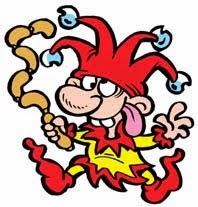 Back in the 60s, Pippin, the comic for the very young had mostly full cover picture on the front, with a tiny bit of text that was part of one of the stories (but they often through in a puzzle or some hidden objects into the picture to keep the kids interest). This was not quite as good as the full strip covers, but the cover tied into the story, gave something more, and had the little puzzles too. A good way to use a cover without generic poster. 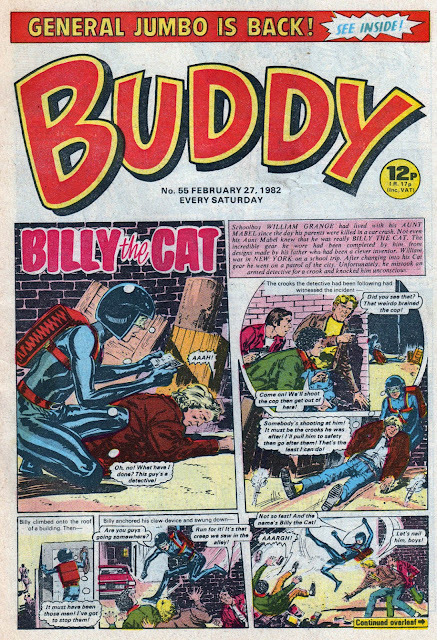 I think just bland poster covers just don't make me interested.. doesn't tell you a thing really, and like I said, if you go back a few years to the time American comics did stupid 10 different covers per issue, you had covers which had no relation to the comic. Featuring characters that most of the time weren't even IN the comic.. and often, I found outside of the good cover art, the layout and design of the art in the comic was bland. I can't see why it can't be both e.g. 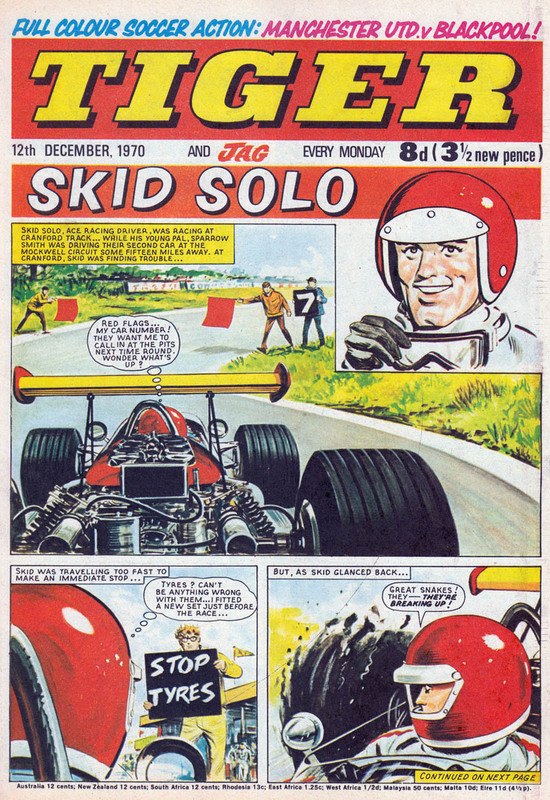 a splash page featuring a strip and its title which then continues into the story within the comic. That's exactly what Tiger did in its later years, Sid. Ryan, Helter Skelter must be as rare as you say because I've never heard of it. Who published it?